CHARLIE CHAPLIN is an instantly recognisable figure; his pioneering silent films are legendary, but not too much is known of his early life. Former Coronation Street star Steven Arnold is hoping to put that right by appearing on stage in Chaplin – the Charlie Chaplin Story. 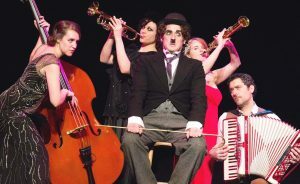 The story is set during the great comic’s stint in London’s Victorian vaudeville scene and the early days of Hollywood. Steven, who played butcher’s son Ashley Peacock in Corrie, says: “It’s an amazing story. It’s about his early days and how he got to where he did. “I started reading his autobiography a couple of days ago and looking at a few other books. I’ve also watched some YouTube clips, and the script includes a lot of detail too. Steven plays Charlie’s brother Sydney, and is almost grateful not to have to tackle the lead role. That task goes to co-star Bryan Hodgson, who studied at the Guildford School of Acting. “He’s such an iconic figure and it was incredible what he achieved,” says Steven. “He had to sail to America, just in the hope that he’d make it. Steven is now getting used to life after Corrie, although he says he still gets recognised despite it being more than five years since he left the ITV soap. “I live in London now and it’s not too bad there,” he laughs. “It’s when I go back up north. It’s such an iconic series and I had such a great time working on the Street. It’s opened a lot of doors for me since I left. It’s been fantastic for me. “But people still stop me in the street and ask about it, or they shout, ‘Hey Paul Scholes!’…but I think they’re taking the mickey.” Steven also put in a – very short – appearance on ITV’s Dancing On Ice show but admits: “It was hard and I wasn’t the best at it. I can’t even dance without skates, so on ice I had no chance! Steven Arnold will appear in Chaplin at the New Victoria Theatre on Tuesday 14 June.